Quizzes are setup to allow you to take them multiple times. When you view a quiz it will show you how many times you have left to take it. To take a quiz, simply view the quiz you would like to take and click the Take Quiz button if it is available. Some quizzes might have a prerequisite quiz defined. This means that you have to pass the prerequisite quiz with a certain score before you will be allowed to take this quiz. If you take a quiz that requires approval before you complete it you will be prompted with a message that the quiz entry needs to be approved. Once it is approved you will be sent a notification that you may continue with the quiz. Once you are taking the quiz you may be presented with types of quiz options. Once you have reached the end of the quiz you will be presented with the option to review your choices. You will have the chance to go back and edit your answers at this time. When you believe your answers are correct select the Mark Completed button to finish the quiz. If the quiz requires manual scoring (Essay or Short Answer) your quiz will not receive a score at this time. It will be scored later. If your quiz does not require manual scoring you will be presented with your scored (or result generated) quiz. I believe these type of questions are familiar to anyone who has ever been to school. I don't think I need to explain their operation. Double Ended questions can also be used for a short 1 or 2 word answer question. The object of a double ended question is to use two sentences where the answers share a common word to create a statement. Ridley Scott directed film with Cage & Rockwell. Matchstick Men in Black Comedy about aliens starring Tommy Lee Jones and Will Smith. Matching questions will have a list of questions on the left and their jumbled up answers on the right. Enter the letter from the right side into the box on the left side. These type of quizzes will ask you a series of multiple choice questions to generate a result based on your answers. You can view your quiz history from two areas. When viewing your profile there will be a tab to show your vBQuiz results. You will see a list of the quizzes you have taken and the quizzes you have created. From the main vBQuiz page you can select the My Quizzes dropdown and select Quizzes I've Taken to view all the quizzes you have taken. From this page you can sort and view all your results. There are links to go either to the quiz or directly to your results. Click the Add Quiz link to start Creating a Quiz. Once you have filled these fields and submitted the form you will have a button appear to allow you to start adding question. Create a test that allows the user to select multiple answers by clicking on check-boxes. Creates a test that gives a result to the user based on the questions they select. 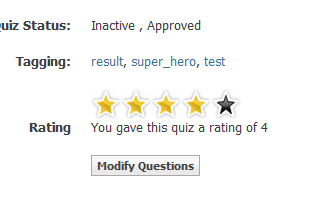 This version only allows the quiz creator to assign one result per question. Creates a test that gives a result to the user based on the questions they select. This version only allows the quiz creator to assign more than one result per question. Create a test that allows for a single test that has Multiple Choice, Check-Boxes, Fill In The Blank, and Matching. Once you have completed filling out all the questions and answer you want on the quiz return to the main quiz page by clicking on the Return to Quiz link in the bottom left corner. Select the Quiz Options dropdown in the top right corner and select Activate Quiz. This will remove the modify questions button and allow users to take the quiz, if the quiz has been approved and the start date has been reached. 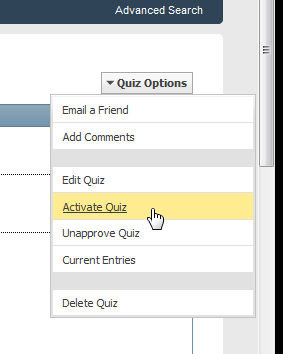 If at any time you wish to change the questions or answers on the quiz simply select the Quiz Options dropdown again and select Inactivate Quiz. If you are the quiz creator or have modify or approval permissions, you can view the status of the quiz on the quiz page.